Tina Campbell, the multiple award winning soloist, multi-Grammy® winning recording artist, author, WE tv original series star, and now web series star, who, with sister Erica is one-half of the iconic Gospel duo, Mary Mary, unveils her new single, the Gospel/Pop ballad, “Too Hard Not To,” this coming Friday, July 28th, on sister Erica Campbell’s nationally syndicated morning radio show Get Up! Mornings With Erica Campbell. Along with husband Teddy Campbell and Grammy® winning producer Warryn Campbell, among others, Tina set out to create a series of new songs representing multiple musical genres, from the pop sounding, inspirational ballad, “Too Hard Not To,” to World Music/Caribbean sounds and Southern Gospel to Hip Hop and Urban Soul, to Praise & Worship, and even Country/Rock, all while shining a white-hot spotlight on her inimitable and powerful vocal range, and her ongoing impact as a songwriter/producer. Multiple videos and new photo images were shot throughout the course of one exciting week in LA. Promotional dates coinciding with the long-awaited new single release and upcoming album are scheduled in the coming days with a full tour to follow later this fall. Cities included so far are Chicago, IL, Columbus, OH, Memphis, TN, Birmingham and Montgomery, AL, Atlanta, GA and other southern cities, New York, Washington, DC and Houston. An extensive schedule of high profile media, promotional activities and special events in each of the markets are booked around the single launch. Included on the packed itinerary will be appearances on Chicago’s Windy City Live/ABC (July 31st); CBS 46 Atlanta & Peachtree TV (August 3rd); WFSA/NBC 12 News, Birmingham, AL (August 4th), Get Up! Mornings 1 Year Anniversary Concert, NY, August 7th, at Wingate Park in Brooklyn with sister Erica, Fox’s Good Day DC (August 10th), Treasures of the Heart–A Woman’s Experience with Ylawnda Peebles in DC on August 11th, The Black Family Reunion in Cincinnati, August 20th, The World Changers Women’s Conference in Houston, September 23rd and on September 30th, the Annual Circle Of Sisters Expo in New York. “It’s a tremendous blessing to write and sing songs, and author books, and produce shows, and share my life, and communicate my faith, and fully be who I am and have the platforms on which to do so. My sole desire is to inspire, with God as my source of inspiration. I believe this new single and upcoming album, my returning reality show and web series, and all my endeavors, afford me the opportunity to do just that,” the singer stated. The Number One debuting album It’s Personal scored double wins last year at the 31st Annual Stellar Gospel Music Awards, with Traditional Female Vocalist and Traditional CD of the Year honors, in addition to the 2016 NAACP Image Award winner for Outstanding Gospel Album. Along with her husband Teddy, Tina currently co-hosts the couple’s popular web series, 10 Minutes with Teddy and Tina, a bi-weekly series discussing life, love, family and faith. The series has reached over 200,000 views and counting. See below link from a recent episode. 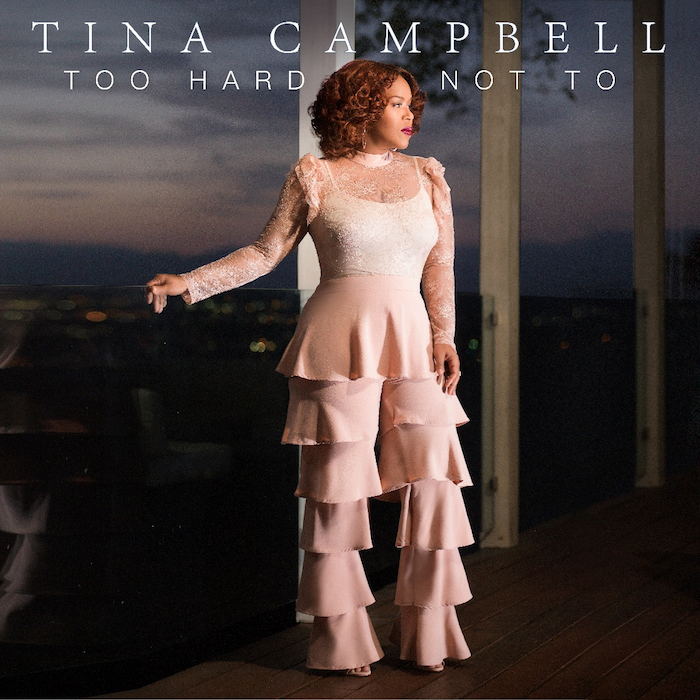 This entry was posted in Gospel, Reviews and tagged It’s Still Personal, tina campbell, Too Hard Not To by Kris Patrick. Bookmark the permalink.